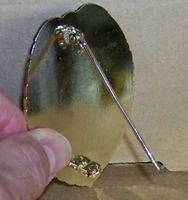 Private Investigator Badge for detectives and investigators in gold or nickel finish. Solid professional PI badge in gold or nickel finish. 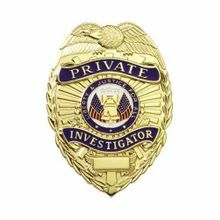 You will look the part with this professional private investigator badge. Size is 3 inches by 2.25 inches. Wording says "Private Investigator" in enamel scroll. Pin on back to attach to your shirt or holder. This badge is shield shaped and has the words �Liberty and Justice for All� emblazoned in a blue bordering banner that surrounds two red, white and blue American flags in the center of this badge. The badge attaches to clothing with a vertical pin and clasp. This badge also works well in a badge holder or inside a badge wallet ready to be displayed when needed. The badge does not confer any authority or privilege. You must meet the requirements of your licensing authority. Also, remember to use the coupon code �NRA� for 5% off your order.